Transfer rice, dal and fenugreek seeds to a large container, add 4 quarts water and let it soak overnight at room temperature. Drain water into a bowl and set aside. Grind the mix in a food processor or grinder, adding water as needed to get a smooth grainy paste. Transfer to a large bowl. Add additional water as needed and mix well so that the dough consistency is thin and would leave a thick coat on the back of a spoon when dipped. Add about 2-3 tsp salt and mix well. Leave it in a warm place for 6-8 hours. Spray an electric griddle or a dosa/non-stick pan with non-stick spray. Heat to 350 deg F or to medium-high heat on a stovetop. Add ¼ cup dough to the pan and spread it in a sweeping circular motion, to obtain a 6-8" diameter thin dosa. Please note that the dosa should appear porous in order for it to be crispy. Add additional water to the mix if the dosa appears to be thick. 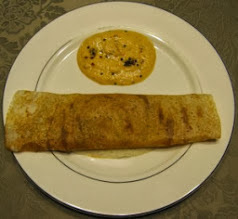 Add about ¼-½ tsp oil around the rim of the dosa and also a few drops to the center. When the bottom appears crispy and is golden brown, slowly flip it to cook the other side. When both sides appear cooked and crispy, flip it again and then add 2 tbsp potato masala (recipe below) to the center and fold both sides over. Remove from the pan. 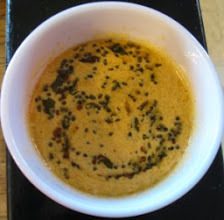 Serve with coconut chutney (recipe below). Heat oil in a sauce pan, add mustard seeds and cover the pan. When the seeds have popped, add curry leaves, stir for 15 sec. Add potatoes, onion, green chilli, ginger, turmeric powder and salt. Stir well. 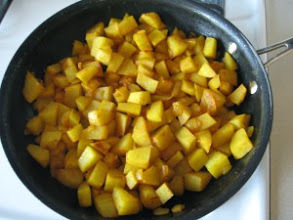 Add 1 cup water, salt to taste and cook covered until potatoes are well cooked. Cook uncovered until the mix is semi-dry. Grind coconut, chana, onion, ginger and 1 cup water, to a fine paste. Add salt to taste. Heat oil in a sauce pan, add mustard seeds and cover the pan. When the seeds have popped, add curry leaves, stir for 15 sec, and then pour into the coconut chutney. Pori kadala used in coconut chutney can be replaced with additional grated coconut or peanuts. 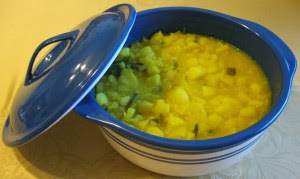 Cook potatoes, onion, green chilli, ginger, turmeric powder and salt in 5 cups of water. Remove from heat. Add curry leaves, oil, and stir well. Quantity of water can be varied depending on the required consistency. Heat oil in a saucepan and fry onions until lightly browned. Add papaya, turmeric powder, chili powder and salt. Stir well. Cook covered on medium heat until papayas are well cooked. Remove cover and continue cooking on low heat for about 15 min, or until dry. Cook moong in 3 cups water and set aside. 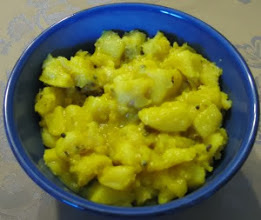 Cook bananas in 2 cups water with turmeric powder, chili powder, black pepper and salt. 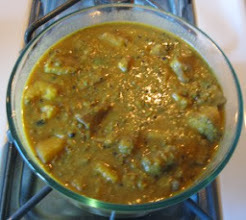 Add cooked moong, stir well, and simmer for 15 min. Remove from heat. Heat oil in a sauce pan, add mustard seeds and cover the pan. When the seeds have popped, add cayenne pepper and curry leaves, stir for 15 sec, and pour into the spinach mixture.